A dental crown, which is often referred to as a "cap", is placed over the entire tooth to not only restore the natural look and function of the tooth, but also to provide strength to a weakened or damaged tooth. 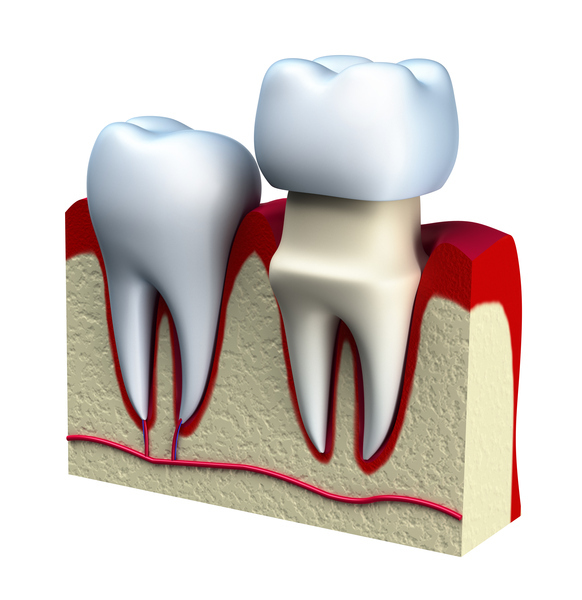 A crown is designed so that it will cover the entirety of the tooth that can be seen above the gum line. Crowns are a very common dentistry procedure and are done to help with cavities, broken teeth, severely damaged teeth, or teeth that are stained or otherwise unsightly. Not all instances of these conditions necessarily need a crown however, and you need to work with Dr. Coulter and Dr. van den Hoven to determine what options are best for you. Our knowledgeable staff can help you determine the best course of action for you based on your unique and individual needs. • To protect and strengthen teeth which have been weakened by decay or have fillings that are failing. • To prevent further breaking and damage to teeth as a result of existing damage. • To help with root canal work and to fill gaps where more than one tooth in a row is missing or damaged. • Dental crowns can be used to cover a tooth damaged and worn down by bruxism, commonly known as the grinding of teeth. • Crowns can help to cover the damaged inner part of the tooth that has been exposed or compromised. • To cover a tooth that needs a filling but cannot be filled because there is not enough of a good tooth left to hold the filling. • A dental crown may be used in certain cases to hold bridgework in place. • They can also be used to cover a dental implant. • Crowns can be used for dental work or for strictly cosmetic needs. • There are three basic types of crowns that you can consider for your various dental work needs. This is a special type of crown that is comprised of porcelain coated metal. The metal is used to make a form of the tooth and then the porcelain is placed over the metal to give it a realistic appearance. This is a favorite crown style and it is usually preferred for repair work. It is often used to cover teeth after major repair work as been done since it provides the strength and protection of metal with the cosmetic appeal of the porcelain. The porcelain crown is unique in that it is made completely from porcelain. Generally, porcelain is used in cosmetic cases and when the front teeth are involved. As they are more brittle and not as strong, due to the lack of metal reinforcements, they generally are not used on back teeth. Porcelain crowns do not have the strength to stand up to the wear and tear and pressure that the back teeth are subjected to on a regular basis. This is a basic crown type that is made entirely of metal. It is generally recommended for use on the back teeth since they are stronger and more resistant to bite forces than porcelain crowns. They also do well on the back teeth since the metal is not as obvious and is not as big of a cosmetic concern. Whatever your crown needs may be, our friendly and knowledgeable staff can help you make sense of your dental needs and help you find the crowns that will work best for your needs.